Irresistible photographs by one of the Cape's well-known locals, for those who love dogs and love Cape Cod, wherever you are now! DOGS ON CAPE COD will bring back the blissful feeling of those long walks on the Cape with your loving, furry companion, wherever you are right now. Anyone who has ever met Kim Roderiques, even on one occasion, knows of her pure affection, and, quite frankly, her obsession with dogs. Having had dogs throughout her life, it wasn’t until Kim reached adulthood that she began to comprehend the incredible gift they give to us. This book began when Kim's dear friend arrived on the Cape with her new puppy, a Cavalier King Charles, named Murphy. From the first moment Kim photographed the puppy, she began to see the Cape in a very different light; she saw it through Murphy’s eyes. His wonderment of seeing everything for the very first time, made it evident how much he loved his home. And, with that, the idea was born to publish a book capturing the love that dogs have for this unique environment. DOGS ON CAPE COD conveys the special happiness the Cape has to offer every kind of dog. "It's the sand, it's the water, it's the light, it's the freedom, it's each other," says Kim about dogs and Cape Cod. DOGS ON CAPE COD takes you on a photographic journey through the Cape, witnessing a wide variety of dogs enjoying their very favorite activities in this special place. It features humorous, poignant, and endearing photos of dogs of every age, from puppies to elderly dogs. Whether pure bred or mixed, their importance in our lives always proves to be extraordinary. This book captures the heart and soul of dogs on Cape Cod. You may leave the Cape, but you never leave it behind. Kim Roderiques has lived in Chatham since 1975, the town her father was born and raised before he departed for the Navy. At the end of 1976, her father and stepmother purchased a clothing store, The Trading Company, where Kim has worked the last thirty-six years. Kim is also an accomplished portrait photographer, whose work has been exhibited in juried shows in the Boston area and been published in national magazines. Kim expanded her professional horizon when she decided to start a pet portrait business in addition to her family portraits. Twenty years later, Kim still thoroughly enjoys the interaction with all of her dog clients. She never tires of the element of surprise that dog photography provides; it is always a wonderful escape of pure joy. She feels that observing the relationship between the owner and their dog defines the purest meaning of friendship. 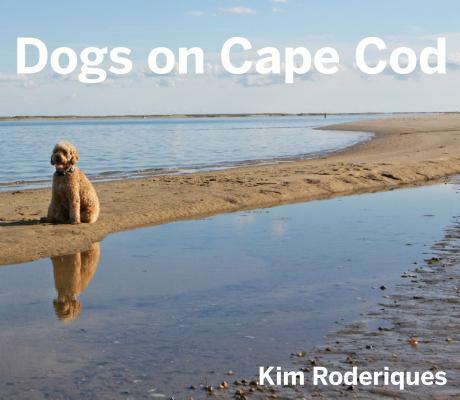 DOGS ON CAPE COD is Kim's first book. Relatively few lucky pups get to romp on the beach, so photographer Kim Roderiques has shared the unleashed joy of canines captured in mid-frolic in Dogs on Cape Cod. A celebration both of dogs and the natural beauty of the Cape--its beaches, gardens, dunes, grasses and glowing ambience--Roderiques's settings are perfect frames for the more than 200 dogs pictured, some captured in joyful play, others posing for portraits. Elegant purebreds (a trio of British cream golden retrievers, a pair of pulis, a quintet of West Highland white terriers and more) dominate the images, but numerous mixed-breeds share the pages, underscoring a mission of the full-color oversized volume: a portion of the proceeds from sales goes to the Animal Rescue League of Boston's Brewster shelter. Occasional literary quotes celebrate man's best friend. "Dogs are a link to paradise," reminds Milan Kundera. A line from poet Mary Oliver captions a photo of Irish setters in golden grasses: "of all the sights I love in this world--and there are plenty--very near the top of the list is this one: dogs without leashes."